Retro Acid celebrates the joys that we experience thanks to the famous silver box, the Roland TB-303 bass machine, the machine that had such a huge impact on electronic music, and is still a big influence for many artists today. It sure as hell made us dance till the break of dawn and beyond… actually, we’re still losing our minds over these sounds today! In other words, Retro Acid is thé party for any 303 fan and its unmistakable old-skool Acid sound. For this edition we invited one of Holland’s most prestigious live acts, the Acid Junkies, who used to be a frequent guest at Retro acid and each time delivered a splendid performance. It’s been a while, but they’re back and since they have been releasing new material as well as re-issuing old classics so we thought it would be the perfect timing to get them back on the Retro Acid stage! Acid Junkies stand for unique live performances embracing all flavors of acid, touching 20 years of their work, from the early releases on the legendary Djax-Up-Beats to their recently launched AJ Records. It’s no secret that Holland played an important part in acid history, so we also invited Rude 66, hailing from the famous Bunker posse. He’s known for his real live-acts with only analogue equipment and lots of improvisation on the spot. A string of EP’s on leading labels like Bunker, Vynalogica, Angelmaker, the Crème organisation and Viewlexx established Rude’s name as one of the masters of the dark side of electro-wave and acid. He also runs a weekly radio show at I-f’s Intergalactic FM internet radio station and is a member of the 303 Allstars, a live acid collaboration with Cosmic Force, the Acid Junkies, Zero One and Drifter. The Dutch live masters will be joined by some Belgian names from past and present, starting with Rave Our Souls who came into action after realizing that they missed the early nineties party vibe and made it their mission to bring it back today. They rock it every time on their legendary Rave Our Souls parties and this year took the festivals by storm. 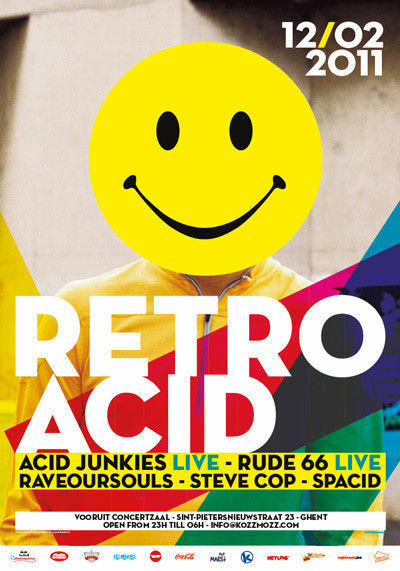 Especially for Retro Acid they will play a fun-packed acid set which will put the smiley in the acid. Steve Cop on the other hand was a steady figure in the nineties party scene with residencies at about any big club at that time from La Rocca over Café d’Anvers to Fuse and many others in between. These days he doesn’t play that often anymore but when he does, he knows how to revive those old days like no other. Be prepared for a true acid attack from the original acid masters!